This Test is intended for flight crew, aircraft mechanics, ground-crew and frequent travelers wishing to check for possible contamination by TCP- type neurotoxic agents. This contamination may be caused from exposure to engine oil or hydraulic fluids emanating from the aircraft’s pressurization and air conditioning systems. 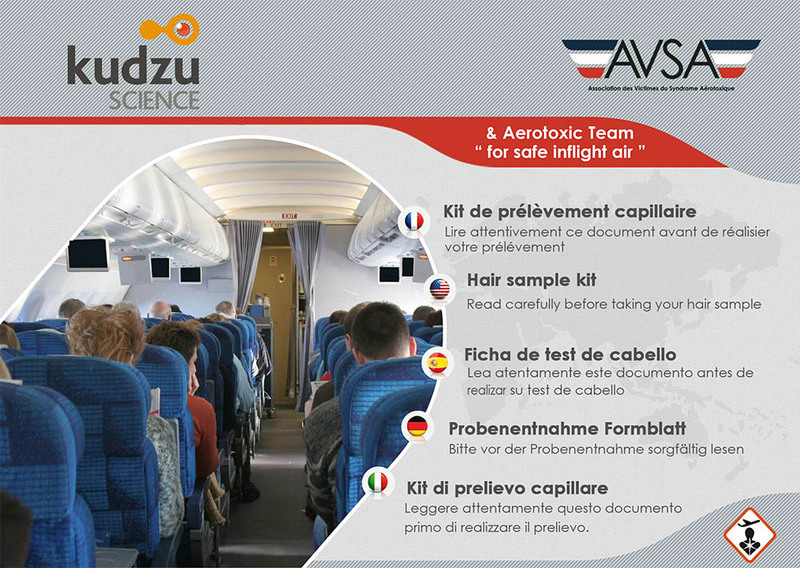 This Hair Test Kit was developed jointly by AVSA and the Laboratory KUDZU SCIENCE (IRES) located in Strasbourg. With a few hair samples an individual laboratory analysis is performed within 15 days. Traces of contaminants are detected and their concentration is assessed individually over a specific period of time. From a single strand of hair, Kudzu SCIENCE can take stock of your exposure over the last 3 to 4 months. The analysis and results are subject to strict confidentiality; the detailed procedure, equipment and packaging of your samples are included in the Hair Test Kit. The presence of several isomers of TCP in the hair that are also present in the oils for aircraft engines, attests with high probability your exposure to aircraft engine oils. IMPORTANT: Should you intend to use the results of this test to support a legal case, it is highly recommended to avail of the help and support of a licensed physician to take the sample.